“To every action there is always opposed an equal reaction” Sir Isaac Newton. 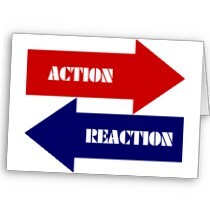 This week, our Toastmaster Rene will share his wisdom and enlighten us on action and reaction. Sometimes we sit back, wait for the reality to hit us and then we react but sometimes we take direct action and help to shape the reality. When we are in action, we are much more productive and can even realize our goals.. by identifying our goals and working with our mentors – we are destined for success. Our second part of the meeting is dedicated to the workshop focused on learning and growing! This is definitely one meeting not to be missed!